Flat plate collectors are usually chosen for their sleek design and ability to integrate into your roof seamlessly. 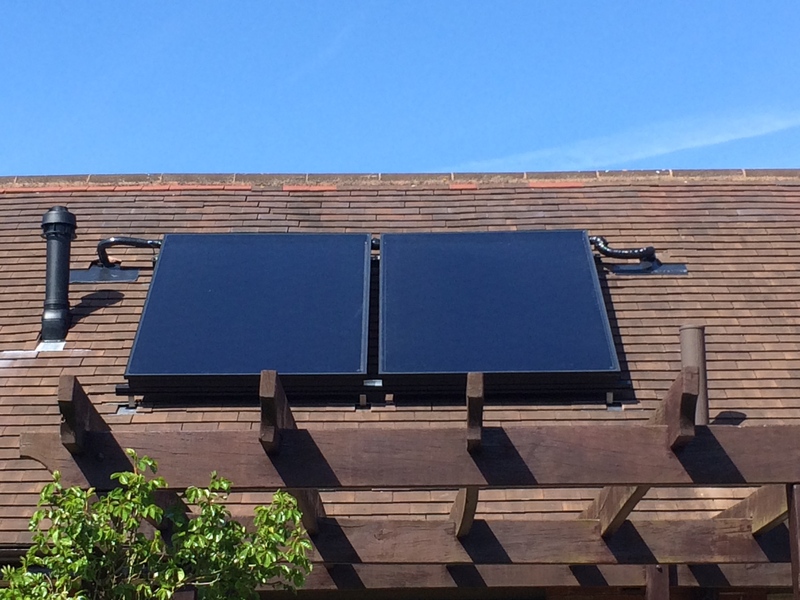 Our experienced renewable engineers will design the perfectly sized Solar Thermal system to match your properties demand, to ensure that you will reap the maximum benefits from your system and save as much as possible on your energy bills. To Request a quote for your Solar Thermal System, Contact Us Today. Joule have backed their Navitas Thermal Collector Panel with a 10 year warranty, all associated parts including the pump station, control panel and expansion vessel are also guaranteed for 2 years. We recommend an annual service on your solar thermal system which will include changing the heat transfer fluid within the panel. You can trust Hero Renewables to recommend the best system to suit your needs. Joules’ Navitas Thermal Collector comes in two sizes, 2m and 2.5m panel both have an average efficiency of 79.4%. Depending on your roof space and hot water requirements, we will size the optimum system to ensure you’ll receive the most savings possible. The panel comes in a stylish, low-profile all-black finish and a profiled aluminium frame. You are able to choose to have the panels sitting flush in-roof with tiles, or simply placed on-roof on a mounting frame. By integrating solar thermal into the design of a heat pump, it is possible to to offset 60% of your hot water demand per year, therefore heavily reducing the running costs of your heat pump and subsequently, the lifespan. To find out more about heat pumps, continue reading by clicking here.